As he got older, he only got more beautiful. His steely blue eyes took on a special glint as his hair grayed. Years before Brad Pitt came onto the scene, even a middle-aged Paul Newman had a six-pack that was the envy of most men. And when his physique started to decline, as it does for us all, his cocky voice took on a smoky, gruff quality that denoted a world-weariness, which he put to good use in some of his later films, like Fort Apache, The Bronx (1980), The Color of Money (1986), and most recently, Cars (2006). According to Eric Lax, his biographer, Newman's looks got in the way of his career early on. 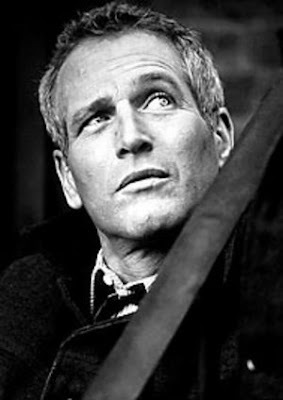 Often finding himself up for the same roles as his Actors' Studio contemporaries, James Dean and Marlon Brando, Newman was having some trouble standing out. Too good-looking for Dean's roles, and resembling Brando a little too closely, his film career was slower to start. But Broadway had no trouble putting him to work, where he debuted in the original production of Picnic. After a stumble in his first film, the ill-suited costume drama, The Silver Chalice (1954), he recovered nicely, playing boxer Rocky Graziano in Somebody Up There Likes Me (1958). Soon his acting prowess, underscored by his good looks, established him in a number of roles. He usually played rebellious, good-natured scoundrels. Some of the standout ones include Brick Pollitt in Cat on a Hot Tin Roof (1958), pool player "Fast" Eddie Felson in both The Hustler (1961) and The Color of Money, Lew Harper in both Harper (1965) and The Drowning Pool (1975), and Reggie Dunlop in Slap Shot (1977). He could also be depended on to play real-life figures such as the aforementioned Graziano, Billy the Kid in The Left-Handed Gun (1957), the title character in The Life and Times of Judge Roy Bean (1972), the title character in Buffalo Bill and the Indians, or Sitting Bull's History Lesson (1976), and Governor Earl Long in Blaze (1989). His most iconic performances are a toss-up between Luke Jackson in Cool Hand Luke (1967), which I reviewed recently, and Butch Cassidy in Butch Cassidy and the Sundance Kid (1969). The latter film would mark the beginning of his friendship with Robert Redford, and the two would team up again with that film's director, George Roy Hill, for The Sting (1973). He worked with some of the best directors in history including Robert Altman, John Huston, Sidney Lumet, and Martin Scorsese, eventually becoming a director himself. He was nominated for an Oscar a whopping 10 times (nine as an actor), taking one home for his reprise of Eddie Felson in The Color of Money. But in my opinion, his best role is often overlooked as the eponymous Hud (1963) directed by Martin Ritt. As Hud Bannon, he plays a truly self-loathing, and despicable ranch hand. An alcoholic and bar brawler, Hud is more trouble than he's worth for his honorable father, Homer (Melvyn Douglas), and an idol to his orphaned nephew, Lonnie (Brandon De Wilde). Their housekeeper, Alma (Patricia Neal) is attracted to him, but keeps her distance. Eventually, a mismanagement of the family cattle ranch leads Hud to try to declare his dad incompetent. In a rage, he sexually assaults one of the more sympathetic friends he has, Alma. Newman is able to get away with playing this disgusting individual in a way which I think few could have. Using his looks and easy-going charm, he lulls the viewer into a false sense of identification with the character. It is only with Alma's assault that we, and Lonnie finally get a glimpse at the true measure of this sadly deficient man. I could go on writing about Newman for hours more. A faithful husband to actress Joanne Woodward, with whom he appeared in 10 films, a prominent liberal on the national scene, a champion race car driver, and charitable entrepreneur with his line of Newman's Own food products, Paul Newman was a true renaissance individual. Sadly, he never got to take part in the oft-rumored third collaboration with his friend, Redford. He died yesterday at the age of 83. A beautiful tribute to a beautiful man. Thank you. I never met Newman but he came to my mother's school to stump for Eugene McCarthy in '68 and she threw snowballs at him. I think he took it good-naturedly, which was his style. Great tribute - and thanks for the biographical details about his early career, which I did not know. I haven't seen yet Hud but spurred by the bad news (as often happens, unforunately) I am watching it - and hope to write about it - this week.